After years spent on the road outrunning bad memories, blue-haired teen Hayley Kincaid and her troubled, army veteran father return to their hometown in New York. Having been home-schooled for the last five years, Hayley cautiously re-enters the world of traditional learning, a repulsive realm populated by high school “zombies” (the in-crowd) and a few rebellious “freaks” like herself. Although she impresses few at first with her snarky attitude, she slowly becomes accustomed to her new life, and even gathers a handful of friends (other “freaks” like herself). In the back of her mind, though, is a fear that no teen should have to worry about: the constant, sickening fear for her father's declining mental health. 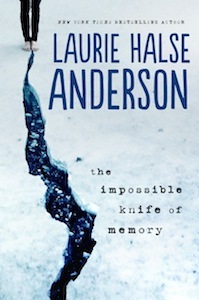 While the prose lacks the gritty, lyrical beauty found in Anderson's previous novel, Wintergirls, this newest offering succeeds in painting a touching, realistic, and perilous portrait of a new era of social issues. Recommended for Ages 15-Up.